We have 2 kinds of diamonds for our unique engagement rings. One is a round brilliant cut diamond, and the other is the Sakura diamond. The Sakura diamond is a very special cut. 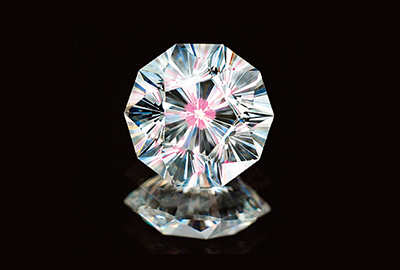 You can see a beautiful sakura cherry blossom within the diamond. The standard carat weight of the Sakura diamond is between 0.2ct and 0.3ct. We can set a bigger carat weight as per your request. Please ask us for details. We mainly select diamonds of VS grade and up, F in color and up. However, we can also provide different varieties depending on stock availability. So, if you have a specific request concerning the 4Cs, (Clarity, Color, Carat weight, Cut), please let us know. Sakura diamonds are rare cut diamonds, so their production is very limited. There are 0.5ct or 1.00ct Sakura diamond, but their availability depends on timing. So please contact us for details. You can select any of our unique engagement ring designs, and they will go beautifully with a Sakura diamond. We are dealing with diamond dealers whom we trust, and our diamonds are certified as conflict free diamonds. Yes, we can change to a prong setting if that is your wish. Please ask us for details. Yes, we have a simple pendant setting. Please contact us for details. That will depend on the design, but with some modifications on the band, yes we would be able to. Please ask us for details. Unfortunately, there are no pink color Sakura diamonds. Most of them are colorless or yellowish in color. Unfortunately, our standard sizes of side stones are too small for Sakura diamonds. The minimum carat weight of a Sakura diamond is 0.15ct and up. We are sorry. We do not sell any loose diamonds.